Reading the first few pages of ‘Tenant of Wildfell Hall’ after long struggle for completing ‘The Old Curiosity Shop’ makes me feel like finding an open road after months inside a humid, vast forest. So refreshing! It took me by surprise finding the novel at the Kinokuniya bookstore last Saturday for prior visits proved nothing interesting in its classic literature bookshelves. So, I didn’t expect it so much. I thought my options would be books by Charles Dickens, again and again. Good thing about life is that it surprises you when you least expect it to happen. And so it did. I read the title and although I glanced at other titles, I knew my eyes stuck at the book and I brought it to the cashier. I didn’t know much about ‘Tenant of the Wildfell Hall’, by the way, but somehow the information that I read that the book is the best by Anne Bronte intrigues me. 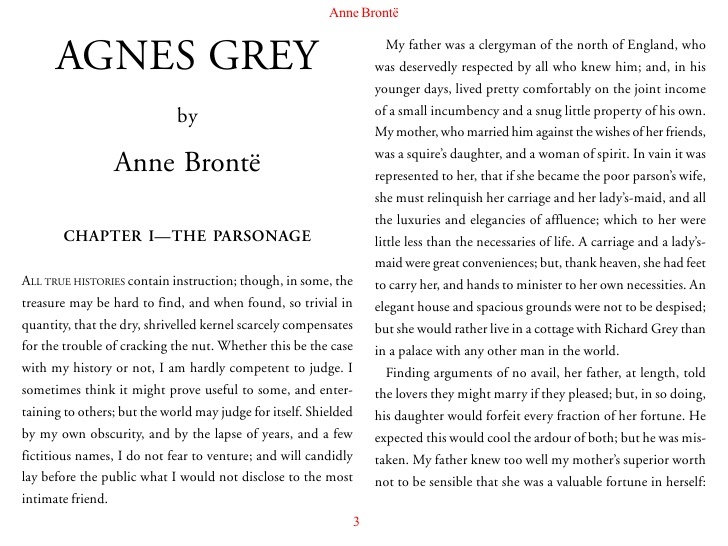 Besides, my first experiences with Anne Bronte’s ‘Agnes Grey’ is quite impressive so why don’t I read her another book? I had been seasoned by adversity, and tutored by experience, and I longed to redeem my lost honor in the eyes of those whose opinion was more than that of all the world to me. … the sun was shining through the blind, and I thought how pleasant it would be to pass through the quiet town and take a solitary ramble on the sands while half of the world was in bed. One bright day in the last week of February, I was walking in the park, enjoying the threefold luxury of solitude, a book, and a pleasant weather…. We are naturally disposed to love what gives us pleasure, and what more pleasing than a beautiful face…. when we know no harm of the possessor at least? If she is plain and good, provided she is a person of retired manners and secluded life, no one ever knows of her goodness, except her immediate connections; others, on the contrary, are disposed to form unfavorable opinions of her mind and disposition…. …. he vainly seeking her, she longing to be found, but with no power to make her presence known, no voice to call him, no wings to follow his flight; ….. the fly must seek another mate, the worm must live and die alone. ‘Agnes Grey’ impresses me in a humble way that has very little connection with its happily-live-ever-after conclusion. In contrary with a number of classic books from various authors that apply third-person narrations, ‘Agnes Grey’ surprisingly steals my heart with its first-person narration. I used not to read novels using first-person narrations because that seemed too easy. Besides, I thought authors who prefer using first-person narrations were unbalanced, meaning that they focused on one or two major characters. But ‘Agnes Grey’ proves me wrong. While the character of Agnes Grey is very closely attached with Anne Bronte, the novelist can, too, voice other characters very well. I can wholly feel the arrogance of Miss Murray, the charisma of Mrs. Grey and imagine her situations in the Bloomfield family. I love how Anne Bronte depicts Agnes as a very consistent woman who defends her beliefs and values despite unfriendly circumstances, particularly while she teaches the Bloomfield children. The way she persists working as a governess despite failure with the Bloomfield family does not lessen her spirit to resume what she loves doing. While I get used to read very thick novels with somber pitch, reading ‘Agnes Grey’, which less than 200 pages in the edition that I read, is such a refreshment. I shouldn’t always take the hardest way to enjoy life through literature. Not only the straight-forwarded plot with very few flashbacks that eases my reading process, the vivid description wrapped in lovely languages also makes the book is completely such a joy. Although the book ends as many readers would expect, I salute Anne Bronte for her act of making it as normally romantic as possible. She puts her love life as important as her family affairs, her career, her pupils and the surrounding. By the by, I adore the way Anne Bronte speaks so bold, cynical in the book. She gives critics to Miss Murray for her lavish life. She mocks the Bloomfield for their failures to teach their kids how to act civilly, control their tempers. She, too, highlights this issue when talking about Matilda who doesn’t even know how to behave like a girl should do. The book really satisfies me. Not as striking as I feel with Thomas Hardy’s books but somehow ‘Agnes Grey’ is sufficient, especially in times when my current mood can be fluctuate at the moment. The perfect reading in turbulent times that lead for a constant scene.